Tonsil stones (also called tonsilloliths) are an annoying oral health problem, but the good news is they are completely benign. In many cases, the only symptoms are chronic bad breath (halitosis) and occasional throat discomfort. Some people are unaware the problem exists, while others find them a nagging, near constant presence. Prevention and treatment are typically addressed without the need for medical attention, except in severe cases. The best advice from both healthcare professionals and those with tonsil stones is to follow a diligent oral care routine. Tonsil stones are benign and not a sign of serious pathology or life-threatening medical conditions. They are most common in people ages 20 to 40 and not often seen in children or older adults. Small tonsil stones often remain undetected by an affected individual and are discovered coincidentally during routine dental exams or x-rays. Until recently, this condition was not regularly addressed by oral care providers. The consensus was that tonsil stones were more of an annoying anomaly than an identifiable medical issue. Sufferers were often told the problem was related to food particles in the mouth and throat. As indicated by their name, tonsil stones form only in people whose tonsils are intact. They are small accumulations of hardened calcium, food debris, mucus, and bacteria. These materials sometimes collect on the tonsils of the soft palate near the roof of the mouth or at the back of the tongue. Most commonly, they form in the tonsil crypts; the concave structures that exist on the surface of the tonsils. Additional anaerobic sulfur compounds are also found in the stones. The presence of these sulfur compounds causes the highly offensive odor associated with the condition. Stones may manifest in clusters or individually. They range in color from white to light brown. A typical stone is about a half millimeter wide and weighs 200 to 300 milligrams, although larger stones have been detected. If you look inside one of these globules, the offensive sensory characteristics are obvious due to the intense, foul aroma they emit. Tonsils are two round lumps in the back of the throat. They are similar to lymph nodes or glands in other parts of the body and are a vital part of the lymphatic system. The purpose of tonsils is to trap and prevent airborne particulates and other matter from entering the body. Another function of tonsils is to filter lymph fluid. The tonsils cannot always differentiate between harmful and benign particles and tend to retain tiny bits of matter. The degree of retained matter increases if the amount of lymph fluid is too excessive for the tonsils to effectively filter. Often, this matter settles into crevices in the tonsils. To date, no universally accepted scientific explanation on the cause of tonsil stones has been published. Current research indicates that there may be an identifiable mechanism at work in the formation of tonsil stones. 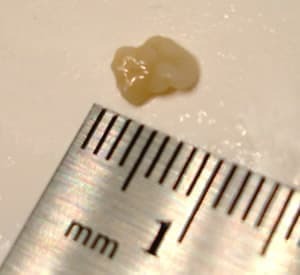 Experts agree that tonsil stones are a byproduct of the accumulation of various materials (as mentioned above) in the tonsil crypts. These accumulations are associated with the growth of fungi and assorted bacteria. As the structures grow, they become calcified and impervious to antibiotic treatment. Chemical processes called “dentrification” occur in the center. Aerobic respiration affects the surface and acidification occurs at the base. According to the majority of published literature on the subject, tonsil stones usually display no significant symptoms. For those who suffer from tonsil stones, this is a clearly misguided theory. In some cases, it is true that no symptoms exist. However, most people with tonsil stones experience a wide array of symptoms that vary in nature and severity. The most common symptom experienced by a majority of affected people is intense, chronic bad breath. That symptom prompts most individuals to seek professional help, which leads to the discovery of the stones. It is wise to keep in mind that all of the symptoms listed below, although often present in individuals who suffer from tonsil stones, are not definitive diagnostic criteria. If discomfort persists, it is important to see a doctor as soon as possible to identify the underlying cause. Bad breath: Results from sulfur compounds and bacteria that comprise the physical composition of the stones. Pain or discomfort when swallowing: Caused by obstruction due to an unusually large stone or by irritation created by the tonsil stones. Throat irritation can also result from chronic coughing or swollen tonsils. Chronic or persistent coughing: A natural response to what is perceived by the body as foreign matter in the throat. Coughing helps expel this matter from air passages including the throat. Irritated or swollen tonsils: Often misdiagnosed as tonsillitis, especially if no other symptoms of tonsil stones are evident. There are other causes of this symptom, but it is a possible sign of tonsil stones. Ear discomfort: Nerve pathways are shared by the throat and the ears. The existence of stones in specific tonsillar areas can cause pain or discomfort in the ears. Many other conditions can cause ear pain, therefore it is difficult to ascribe this discomfort exclusively to the presence of stones. White bumps in the throat: Often visible on tonsil stones, these bumps provide the clearest direct diagnosis. White, coated tongue: An accumulation of sulfur containing components on the tongue and throat may be created by anaerobic bacteria that exist under the surface of the tongue. These are the same elements found in tonsil stones and are responsible for bad breath. The coating is persistent and difficult to remove because its cause is not alleviated with any standard treatment. Metallic taste in the mouth: Results from minute secretions of substances contained in the tonsil stones. Removing tonsil stones is not a difficult process. The only permanent solution is removal of the tonsils. This extreme solution should only be considered in cases in which tonsil stones present a persistent, constant, severe state of discomfort and highly offensive bad breath resistant to conservative treatment methods. There are methods that address the immediate problem on a temporary basis and yield satisfactory results. For tonsil stones that are asymptomatic, e.g. do not cause bad breath, no treatment is necessary or recommended. YouTube user ihatemytonsils, shows us in this video a tonsil stone being removed from her mouth. The first and most effective treatment is to remove the stone(s). This can usually be done by gargling with mouthwash or salt water to dislodge the stone. It may be necessary to use greater pressure, such as an oral irrigator, to loosen stones from the tonsils so they can be easily removed. 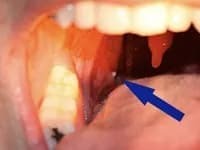 If the stone is not dislodged from gargling alone, carefully push up from the bottom of the tonsil with a cotton swab, eye dropper, or finger, thereby forcing it to dislodge from the crypt. Small, surface tonsil stones can sometimes be dislodged by brushing with a toothbrush. For very large stones or stones that create potentially damaging side effects, surgical removal is a viable option. This procedure can be done under local anesthesia at your doctor’s office. Another potentially effective method is to maintain a diligent oral hygiene routine, including regular cleansing of the tongue. One cause of tonsil stones is thought to be initiated by bacteria living on and under the surface of the tongue. Keeping the mouth, throat, and tongue clean minimizes the amount of mucus and bacteria. It also reduces the potential calcification of these substances, a suspected cause of stone formation. Drinking water and chewing sugar-free gum can help prevent dry mouth. Doing so decreases the proliferation of bacteria in the oral cavity and helps control bad breath. It is important to note that a person must be attentive to oral care on a daily basis in order to reduce the risk of tonsil stone recurrence. In addition to being one of the most powerfully effective lines of oral hygiene products available, TheraBreath mouthwashes, drops, toothpastes, sprays, and gum provide potent relief from discomfort and bad breath caused by tonsil stones. The components responsible for the formation of tonsil stones also cause bad breath. Therefore, many TheraBreath products can help prevent tonsil stones from developing within the deep fissures covering the surface of tonsils. However, to address this condition specifically, TheraBreath offers a customized kit. TheraBreath's Tonsil Stones Kit: This starter kit and the deluxe version have everything you need to help prevent offensive, foul-smelling stones from forming. It includes throat spray, nasal-sinus drops, mouth wetting lozenges, and AktivOxigen Serum containing OXYD-8®, a highly effective compound created by TheraBreath founder Dr. Harold Katz. By removing electrons from the chemical composition of an overly acidic mouth, OXYD-8® produces an oxygen rich environment in which anaerobic activity is severely curtailed and the flow of saliva is optimized.